The first speaker at the conference was Roland Siegwart, who is a Professor for Autonomous Systems and Director of the Autonomous Systems Lab (ASL) at ETH Zurich. He began his presentation by highlighting some of the cutting-edge flight concepts first developed at ETH, including fixed-wing aircraft and small blimps piloted via a system of rotors. One of the most interesting projects currently under his lead involves the first-ever autonomous solar-powered Unmanned Aerial Vehicle (UAV) to cross the Atlantic Ocean. According to Siegwart, the progress made within this area has led researchers to conclude that it is now technically feasible to produce UAVs that can stay in the air for truly unlimited periods of time. More generally, a key focal point of Siegwart’s research has been the development of increasingly intelligent systems capable of operating autonomously in a range of complex environments. His team – along with other research groups at ETH – has broken new ground by equipping UAVs with tools for navigating in ‘GPS-denied’ areas, thereby enabling them to 1) perceive, map and plan their flight-paths autonomously, and 2) complete missions where conventional systems would be incapacitated. ETH researchers hope that these autonomous vision-controlled vehicles will soon act as reliable partners in situations where the environment poses risks to human health, including search and rescue operations, industrial inspections, and more. As became apparent during the subsequent presentation by Mark Müller, who is a researcher at ETH’s Institute for Dynamic Systems and Control (IDSD), cutting-edge drone technology is much more advanced than a layperson would expect. In recent months, for instance, IDSD researchers gained considerable attention with their research on quadcopters. By making extensive use of ETH’s in-house “Flying Machine Arena” (which conference participants were able to visit), Müller and his colleagues have developed highly ‘athletic’ vehicles that are able to solve mechanical problems with specialized algorithms that allow them to learn from past experiences. In other words, the aircraft become better at what they are assigned to do simply by repeating the task. Although it will take time for the above new technologies to become fully operational, we can expect to see spillovers into a wide array of applications, from environmental, humanitarian and recreational uses to those in modern warfare. But even with existing technology, there are many ways in which drones can be applied to complete tasks that were once reserved for humans. The first speaker to explore this development was Dr. Lian Pin Koh, a former ETH researcher who is now an Associate Professor at the University of Adelaide. Pin Koh described in detail his Conservation Drones project, which promotes the use of low-cost, autonomous drones to monitor wildlife populations and protect their habitats. One intriguing aspect of this project is how seemingly unsophisticated drones can become highly valuable assets for researchers and activists alike. While this ‘democratization’ of drone usage may change how the larger public perceives drones (and, to some extent, fix their image problem as military instruments of death), it also raises important questions about the ethical, legal and security dimensions of how they are used – i.e., questions that were picked up in later presentations. Dr. Pin Koh was then followed by Jürg Wildi, who is Vice President of Technology at RUAG Holding AG, and who offered his insights into the rising interest in drone technologies by the defense-industrial sector. In Wildi’s view, the key challenge for companies such as RUAG consists in spotting a promising new technology early on, determining whether there is a sustainable business rationale for it or not, and then entering the development phase in concert with a wide range of partners. For instance, RUAG has been working with ETH researchers on a novel sense-and-avoid system for unmanned aircraft that will increase the safe operations of drones in ever-more-crowded airspaces. Wildi also mentioned RUAG’s role in the development of Switzerland’s current drone system, the Ranger 95, which will soon be replaced by the Israeli Elbit Hermes 900 system, which RUAG supposedly plans to upgrade. Paul Scharre, a fellow at the Center for a New American Security (CNAS), followed next and specifically looked at the security problems raised by drones. First, Scharre elaborated on the threats posed by small, GPS-programmable drones that can act as short-range precision weapons capable of carrying small explosives, or chemical or biological weapons. Given the enormous threat potential of these systems, it is not surprising that this trend has become a prime concern for security professionals. But Scharre also argued that the spread of unmanned platforms has security implications that far exceed the threat posed by ‘terror drones’. In his view, the proliferation of weapons-capable drones around the world (to both state and non-state actors) also raises critical challenges for crisis stability, escalation control, and the long-standing norm of sovereign nonintervention. For example, does shooting down another state’s drone constitute an act of war? Are states more willing to shoot down drones than other aircraft because drones are unmanned? And are states more willing to take risks with drones because human lives are not immediately involved? According to Scharre, these are just some of the issues that will have to be dealt with in a world of expanding UAS proliferation. Following Scharre’s presentation, Kristin Bergtora Sandvik, who is a senior researcher at the Peace Research Institute Oslo (PRIO), offered her perspective on the emerging concept of ‘humanitarian drones’ (also known as ‘disaster drones’). Without denying the potential benefits of drone technology in this field (including disaster mapping and monitoring and bulk transport), Sandvik called for a more critical reflection about the concept. While relying on examples from the aftermath of Typhoon Haiyan in the Philippines, she suggested that some (primarily Western) companies may have used humanitarian action as a pretext to collect precious test flight hours in under-regulated airspaces and thereby gain an edge over their competitors at home. Sandvik also contended that recent discussions about the use of drones to fight Ebola illustrate how drone advocates, in their eagerness to imagine new applications for their systems, often make incorrect assumptions about how they can solve complex problems. Indeed, where Ebola was concerned, “technological fantasies” contributed to a variety of outlandish proposals – including ‘mortuary robots’ to deal with a non-existent Ebola burial problem, and drones that could supposedly detect new outbreaks of the disease by aerially scanning large areas for increases in human body temperature. If taken seriously, misconceived proposals such as these can undermine efforts to improve the situation. In this context, Sandvik cautioned against thoughtless excitement about ‘humanitarian drones’ and emphasized that the business interests of all actors involved must not be overlooked. The final presentation of the day was delivered by Jean-Baptiste Vilmer, a policy advisor on security issues at the French Ministry of Foreign Affairs and a Professor at SciencesPo Paris. In his presentation, Vilmer analyzed the legal and ethical challenges posed by armed drones and targeted killings. He first sought to debunk the claim that there is something inherently different and unethical about armed drones compared to other weapons systems. While acknowledging that armed drones do challenge legal and moral norms, Vilmer emphasized that they can also provide high-quality information that can then be processed by operators in a more stress-free environment, and thereby improving the chances that international humanitarian law is actually observed. Arguing from a consequentialist point of view, he also emphasized that the practice of using drones for targeted killings is not intrinsically unethical, but that more attention has to be placed on how the advantages of drones might be better exploited and abuses prevented. Overall, it became evident during the conference that we remain in the early stages of understanding how integrating unmanned systems will affect our societies. As a result, we should expect the need for dialogue between various stakeholders – from researchers to policymakers and the private sector – to increase with time. In this respect, promoting this dialogue was one of the aims of the conference, and it certainly succeeded in making participants more aware of how fast drone technology is advancing and how extensive its implications are becoming. At the same time, it also bore witness to the dangers associated with the rise of drones, calling for open-minded but critical reflection on how our policies and legal systems should adapt to this new reality. Andreas Kaufmann is a Student Editor at the International Relations and Security Network (ISN) at ETH Zurich. 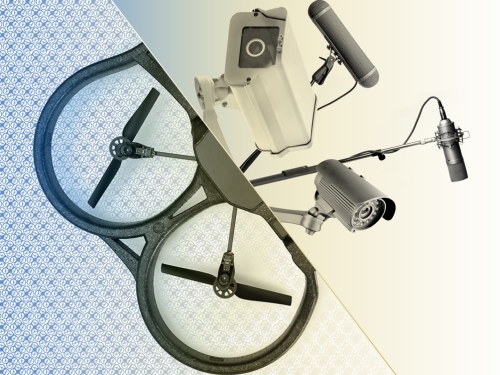 The ability to place civilian use drones in the consumer market allows for economic opportunity through the creation of aerial photography and film making. Limiting use of these drones prevents entrepreneurs from providing a need at a more affordable price. As long as drones arent flown in no fly zones or within a certain altitude restrictions on them should be minimal. Our laboratory is studying this issue: how this new technology is evolving and changing. There are increasingly wide gaps in how the general public sees this technology and how the professional users of this technology see it.